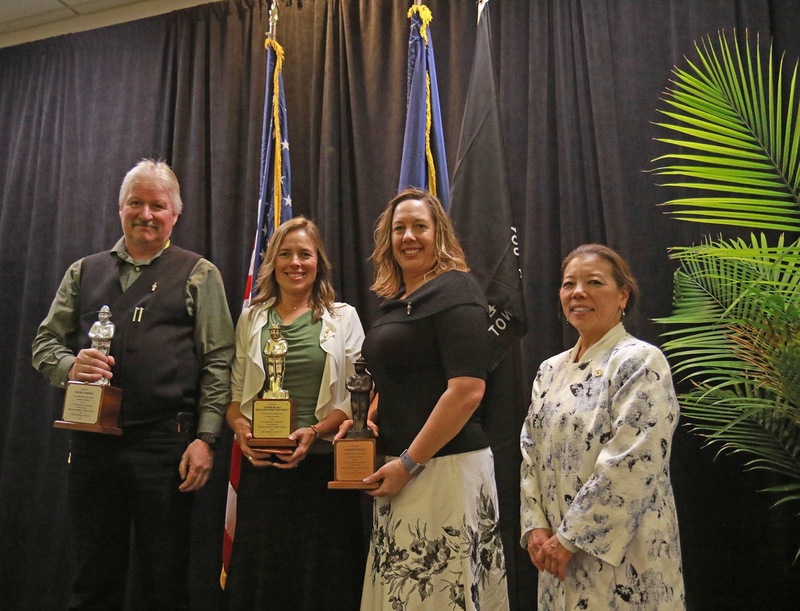 BOISE, Idaho – In a ceremony held today at the Boise Wyndham Garden Hotel, two prestigious awards were given to BLM Idaho wildland fire employees. 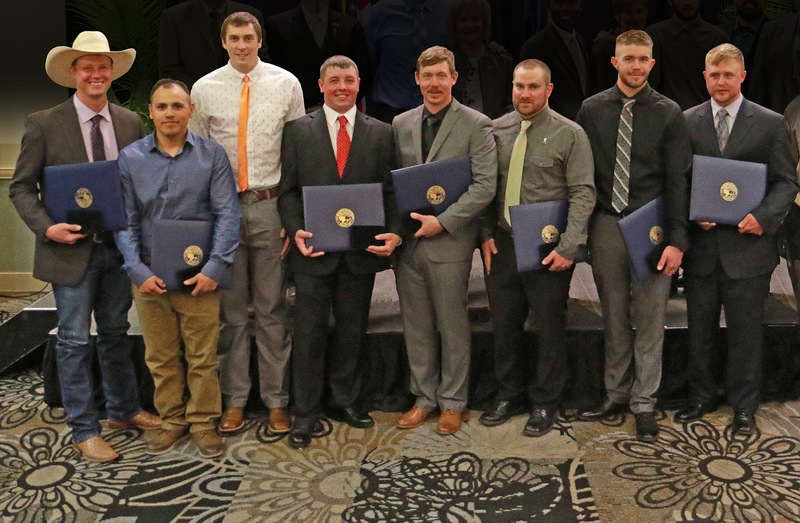 The U.S. Department of the Interior Valor Award was granted to eight Boise District firefighters for their emergency response during a fatal fire engine accident. 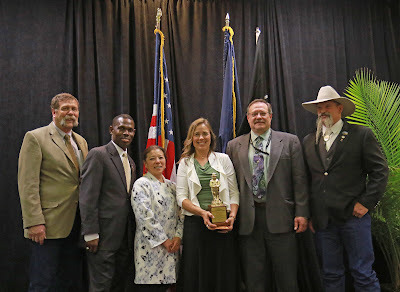 Boise District Fire Prevention, Education and Investigation Specialist Carrie Bilbao also received the Gold Smokey Bear Award for outstanding accomplishments in public service. "In times of crisis, the bravest among us step up and lead from the front," Secretary of the Interior Ryan Zinke said. "Few would have had the courage to do what these eight Boise District firefighters did, and we also owe a special debt of gratitude to Carrie Bilbao for her innovative approach to fire prevention. It is the American way: intrepidity and ingenuity. We have the best people at Interior, and these awards highlight some of the finest in our midst. They have made Idaho and America proud." The U.S. Department of the Interior Valor Award recognizes employees who have gone above and beyond the call of duty and have exposed themselves to unusual risk to serve the critical needs of others, usually in rescue, lifesaving or other critical assistance contexts. In July 2016, eight Boise District firefighters were traveling with a Nevada BLM engine crew in rural Nevada when an engine carrying three BLM Nevada firefighters had a tire blowout and rolled. The Boise firefighters immediately began rendering medical aid to the injured Nevada firefighters. One Nevada firefighter was instantly killed in the accident, while a second succumbed to his injuries in spite of the Boise crew’s best efforts to stabilize him until he could get to a hospital. The Boise crew treated the third firefighter for injuries and shock. The Boise crew, stationed out of Bruneau, was supervised by Ray Michael Bilbao of Cambridge, Idaho, and includes: Damian Martinez of Caldwell, Idaho; Jason Carl Martindale of Harrison, Arkansas; Blaine Thomas Jewett of Mountain Home, Idaho; Garrett Robert Hall of Ashton, Idaho; David Lester Butler of Bliss, Idaho; Zachary William Cada of Boise, Idaho; and Jack William Richelieu of Mountain Home, Idaho. The Valor Award is normally presented by the Secretary of the Interior during an Awards Convocation held annually in Washington, D.C., but not all of the Boise recipients were able to travel for that ceremony last year. Carrie Bilbao, who is no relation to Ray Bilbao, is nationally recognized as an expert fire investigator. Based on her stellar investigative work, Bilbao developed widely praised fire investigation training courses and has used fire causes to develop effective education and outreach campaigns. These campaigns have reached thousands of people, and helped to reduce fires started by exploding targets across Idaho by 80 percent over the past four years. The Smokey Bear Award is the highest national honor bestowed for outstanding work and significant program contributions in wildfire prevention. The Gold Smokey Bear award was given to Bilbao because of her sustained outstanding national service with significant program impact in wildfire prevention over the past two years. The National Association of State Foresters, the U.S. Forest Service and the Advertising Council sponsor the awards, and nominations are considered and voted upon by the members of the Cooperative Forest Fire Prevention Committee. Three levels of the Smokey Bear award may be granted: Gold, Silver and Bronze. 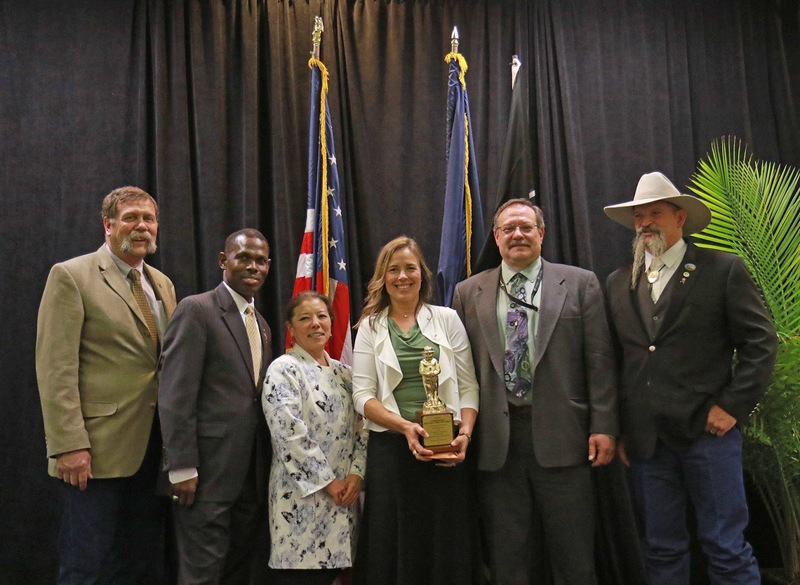 Notably, BLM Idaho employees have won all three levels of the Smokey Bear award in the past three years. Idaho Falls District Fire Prevention and Mitigation Specialist Kevin Conran received the Silver Smokey Bear award in 2016, and BLM Idaho Fire Mitigation and Education Specialist Jennifer Kline received the Bronze Smokey Bear award in 2017. For information about the Secretary’s Valor award, please contact Randy Eardley, 208-387-5895; for information about the Gold Smokey Bear award, please contact Jennifer Kline, 208-373-3963.
left to right: Kevin Conran, 2016 Silver Smokey Award Winner; Carrie Bilbao, 2018 Gold Smokey Award Winner; Jennifer Kline, 2017 Bronze Smokey Award Winner; and Patti Hirami, Acting Deputy Chief, U.S. Forest Service.